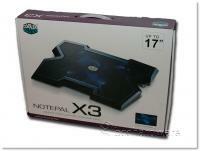 Today we are looking at the NotePal X3 cooler that has recently launched from the Cooler Master laboratory. 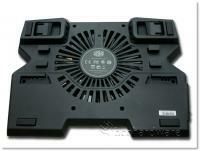 This cooler supports laptops up to 17" and is designed specifically for use on your desk. It doesn't have the range of height adjustment that the NotePal U Stand has, but it does have adjustable feet that enable you to raise up your laptop a little higher. 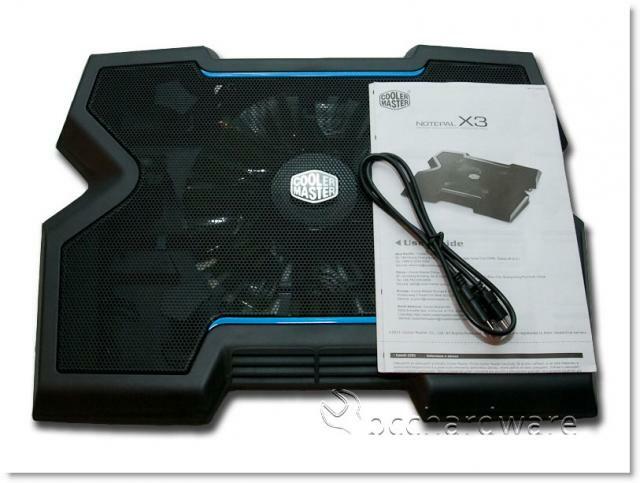 This notebook cooler comes with a 200mm fan and some extra features, such as adjustable fan speed, extra USB ports as well as a front vent that is designed to blow cool air on your hands as well. This unit has nice aggressive styling, solid construction and a light that can be turned on or off. Keep on reading if you need a cooler for your laptop that can also keep you cool too! Cooler Master has been around a long time and are one of the pioneers in the cooling market, so they need little introduction. If you're new to the PC game, take a look below and find out a bit more about this company before we carry on. 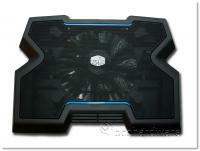 Cooler Master showed off some of their upcoming Notebook coolers at CES 2012 and this was one of them. We've had it around the shop for a while and have been using it extensively. There isn't a lot that comes with the cooler, but really, what more do you need other than a cable? Cooler Master has included a standard USB to mini-USB cable that is long enough to reach to any side of your laptop comfortably. Also included in the "bundle" is a quick installation guide, but if you need a guide on how to use a notebook cooler, you should probably not have a notebook in the first place. As you can see in the images above, the cooler features a nice open top with a wire mesh grill that allows air to freely cool the hot underside of your laptop. Also the bottom is quite open as well, but is closed enough that you could run this unit on your lap, your couch or even by your bed. 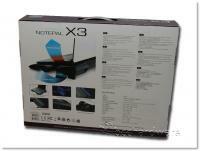 The NotePal U stand on the other hand, was only intended for use on a desk or table. On the next page we'll cover the specifications features before we jump into testing.